We provide you with the ability to safely segregate and pledge your silver or gold bullion as collateral that you have privately stored with us within the global Allocated Bullion Exchange network of vaults in order to raise funds. Following client feedback, the whole Electronic Vault Warrant system is being updated and overhauled. These updates will allow the eVWs to be processed more efficiently and provide you with even greater functionality than before. Once the update to the eVW system has been completed you will be able to continue to segregate your bars, see your bar details and have more direct control over your holdings than previously. Unfortunately this means that the eVW facility is offline and unavailable until this overhaul of the eVW system is completed. We anticipate this to be complete and available again in 2017. Where many precious metals providers don’t offer you the ability to fully segregate your bullion, GoldVu does. Whilst your bullion is, by default, held on a 1:1 allocated pooled basis (the ABX vaults currently operate on last in first out), you also have the option of having it physically separated and segregated from the rest of the metal in the vault. Pledging assets as collateral is not a new concept and is routinely used in many sectors worldwide. However, the facility to use your vaulted physical precious metals is not something that has been widely available to investors as its accessibility has been limited through certain avenues such as private banks. Institutions and brokers are able to use the full brokerage version of MetalDesk as an additional service offering to their clients, more of which is discussed in our section on institutional allocated bullion solutions. The facility to segregate and pledge your silver or gold bullion as collateral has been available through the MetalDesk trading platform for many years, to which all of our clients can freely access. This ability to segregate and monetise your physical gold and silver bullion is enabled through the use of electronic Vault Warrants. Electronic Vault Warrants (eVW) are legal documents of title to your precious metals that are made possible by the Allocated Bullion Exchange. It is with these legal titles that you can use to pledge and monetise the value of your bullion holding as margin collateral. There is a further restriction to using your silver or gold bullion as collateral, which is that ,as the funds raised are margin collateral with a Full ABX Member / Prime Broker, you are limited to using those funds to trade within the other financial instruments offered by that member broker. The first part of the process in issuing an eVW, requires a (your) bar to be physically separated and segregated from all of the other precious metal in the ABX vault. 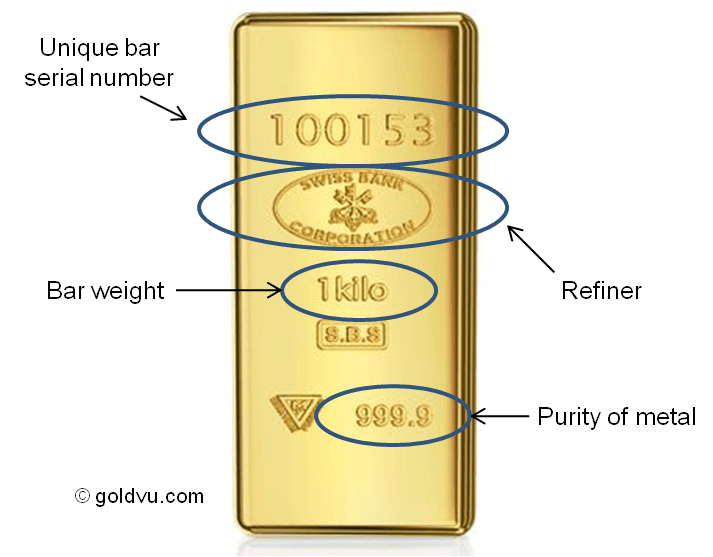 Each individual eVW only represents one specific bar of bullion, so 2 eVW's equals 2 bars, 3 equals 3 and so on. The creation of an electronic Vault Warrant is initiated by you within MetalDesk which incorporates a simple user friendly menu driven approach. You select which individual (or all) eligible bar(s) you want to have the Vault Warrant raised against and the system will then start the process. It will take the ABX vault provider a few working days to action the request and when completed, you will be notified and issued the details of the electronic Vault Warrant. There is a small fee attached to the segregation of the bars, which cover the administration costs of the vault provider. The purpose of the collateralisation process being in two parts is so that GoldVu clients wanting to only have their Holdings fully segregated and separated from everyone else's, can do so. Once the eVW has been issued, you are under no obligation to pledge any of your silver or gold bullion if you don't want to. You can only personally audit and inspect your bullion at the vault if it has been segregated first. As mentioned, this second part is neither compulsory nor an expected action for you to take upon receiving the electronic Vault Warrant. If you are currently with an ABX Member / Broker that suggests otherwise, it would be prudent to change to another such as GoldVu, where your best interests are held first. I personally prefer to have my bullion not only fully allocated but also segregated as simple peace-of-mind and an extra buffer to unforeseen risks. With GoldVu, you will never be made felt to be obliged to pledge your silver or gold bullion. However, there are many that welcome the opportunity to be able to take advantage of using their physical precious metals to raise funds. These funds could then be used to 'work' for you, providing you the prospect of generating an income that doesn't occur with inert bullion. The flexibility that this offers our clients is fantastic and offers you the best of both worlds – privately vaulted physical precious metals and working cash. To raise margin capital, all you have to do is to contact GoldVu, highlighting which eVWs you want to pledge and we can then discuss the details and terms of the collateral contract. Please be clear that you could lose your pledged precious metal if you fail to meet the terms of the contract. Don’t take risks and make sure that you are able to meet the terms before agreeing to them, and make sure you understand the instruments that you are going to invest your raised capital into. If in doubt, always seek advice from an accredited financial advisor. One of the basic terms of the pledged bullion collateral contract, is that it becomes 'locked'. Neither you nor anyone else can sell it, withdraw / take delivery of it or move it to another ABX vault location until the terms of the Warrant have been settled in full. Once the terms of the Warrant have been met, then you can once again have full control over your bar and sell / withdraw / transfer it as normal. At all times that the bar(s) are actively pledged, you still are the full legal owner of it.